Avalokitesvara is a bodhisattva who embodies the compassion of all Buddhas. It is depicted as either male or female in different cultures, and in Unky's rendition at The East Wind, she is depicted as female in today's new release image. I think she is so beautiful! I created a mixed media canvas because I was itching to do one, and I wanted to make something for my mom for her birthday. I am pretty happy with how it turned out. I used a small 5x7" canvas, which I coated with gesso, along with all the bits and bobs that I glued on. 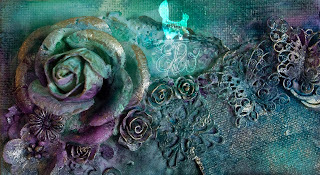 I used flowers, butterflies, buttons, chipboard, lace, a paper doily, and denim. 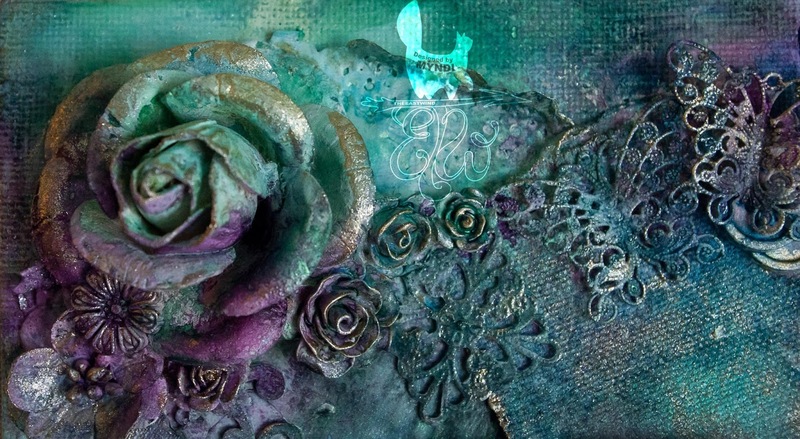 Then I used Lindy Stamp Gang sprays in Victorian Bouquet and Viva Decor paint in gold. I also went around the edge of the image, which I distressed, with the gold paint. Stop by our Facebook group to join in our challenges there, and also by the blog, which has twice monthly challenges. There are quite a few opportunities to win some free images if you join in on the contests! There is an ATG challenge at Aurora Wings and I have been working on this ballerina digi for a couple of weeks now with my Prismacolor pencils. It has been a slow and arduous process, as I'm not usually one to use pencils, so there is a learning curve, plus there is a lot of work with pencils. It's not quite as easy as markers, I'm finding. It is a lot of fun and relaxing for my mind, although I think I am going to end up with carpal tunnel syndrome soon. I am being a bad student and skipping around the Kit & Clowder Perfecting Pencils class, and not doing the actual projects in the class, but watching the videos for "how to" advice. I think Alyce will just be glad I'm using the classes to learn, however I'm choosing to do it. 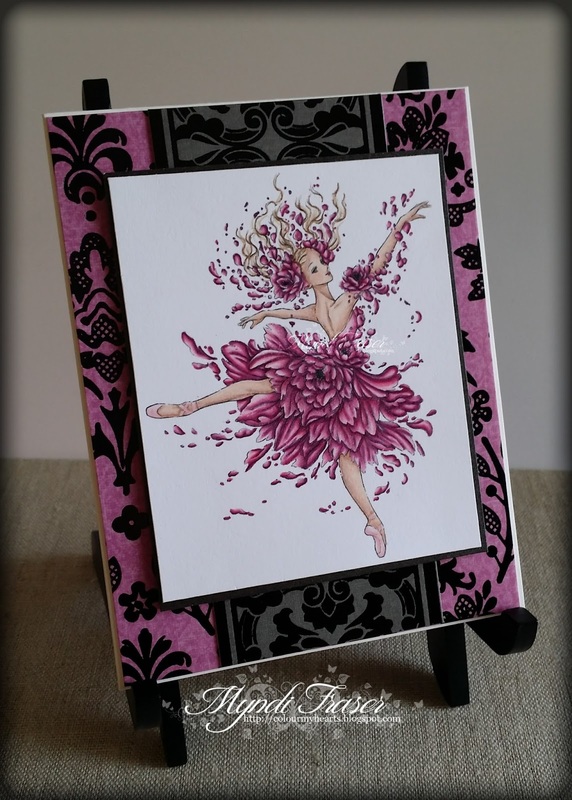 The image I used for this is Flower Ballerina. It is very intricate, which is why I wanted to use pencils versus Copics. I thought it would give me a better chance of shading without the ink moving into places I didn't want it to. I printed it at 3.75" tall, so that is really not very big. I had to have very sharp pencils. The colours I used for her tutu are: Black Cherry, Pomegranate, Pink, and Deco Pink. I kept the layout simple. I feel like Mitzi's images are so beautiful and detailed, it can be a real disservice to add too much bling to the card itself. 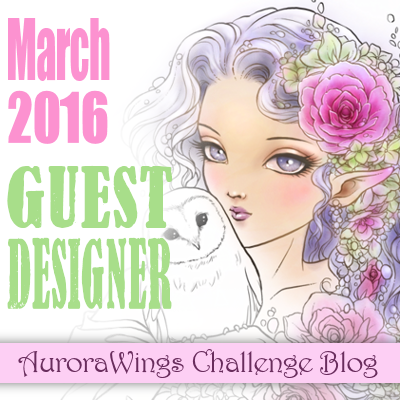 I am entering this into the ATG challenge on the Aurora Wings blog. 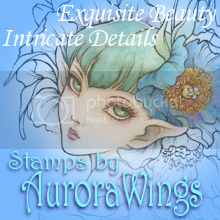 If you love Aurora Wings, you should head over there and check it out! It's time for another challenge at The East Wind, and our challenge theme this time is "Lovin' the Animals". Find a TEW image with a pet in it and submit your entry in the Facebook group HERE. I used Aurora "BlueJ" because people usually think cats and dogs for pets, but my mom loved to have birds. We had lovebirds and cockatoos when we were growing up. They scared me. I thought they were going to bite me or peck me (I saw Alfred Hitchcock's "The Birds" as a very young child and have been scarred since). I would never put my hands in their cage and I hated it if they got out and were fluttering around the house. Freaked me right out. I always envisioned doing this image in pastel colours, and here it is in black and red. Well, you never know sometimes where it will take you when you sit down to colour an image. Make sure you join the Facebook group. 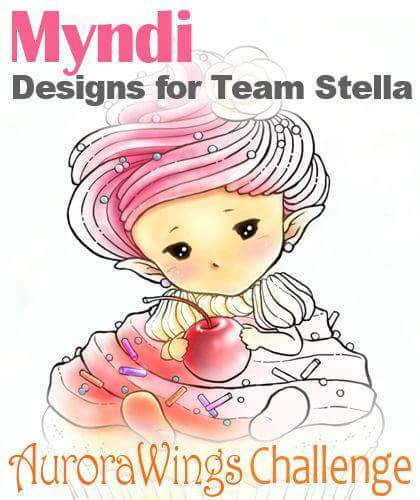 We are running this contest, and mini colouring contests as well. The dates are pretty fluid with those so you have to check back often to make sure you don't miss it. 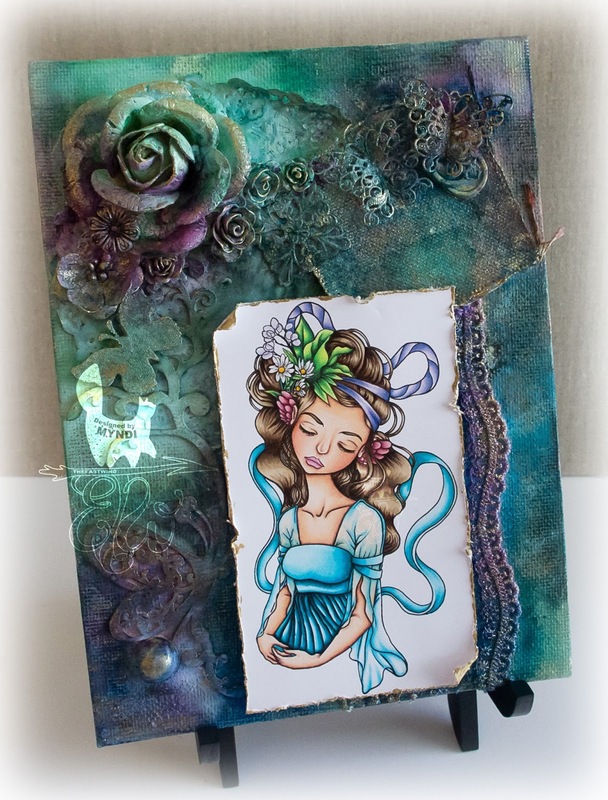 Also, there are twice monthly challenges on the blog HERE. 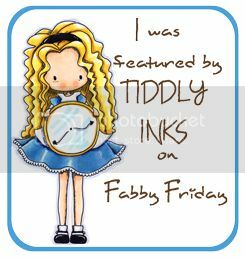 I hope you are signed up for the newsletter so you are getting the freebie each month! The sign up for that is on the blog. It's Tuesday, so there's a new release today from The East Wind! Today's new release is "Apple Seed" and she's spookily good for any Halloween projects you are thinking of doing. 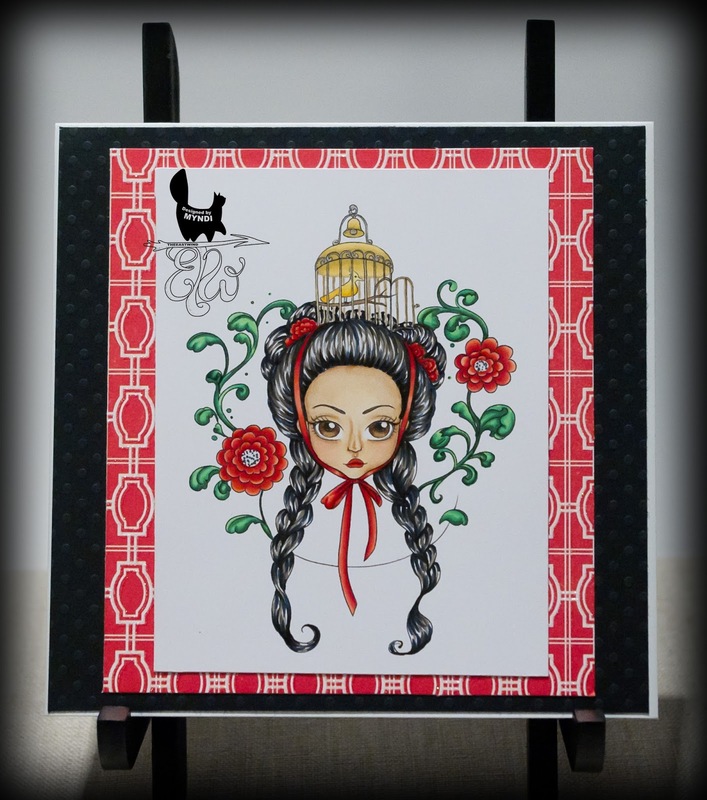 I used the .png file (that you also receive along with .jpg version) with transparent background over a skull print digital paper from Michele R Designs Halloween collection. 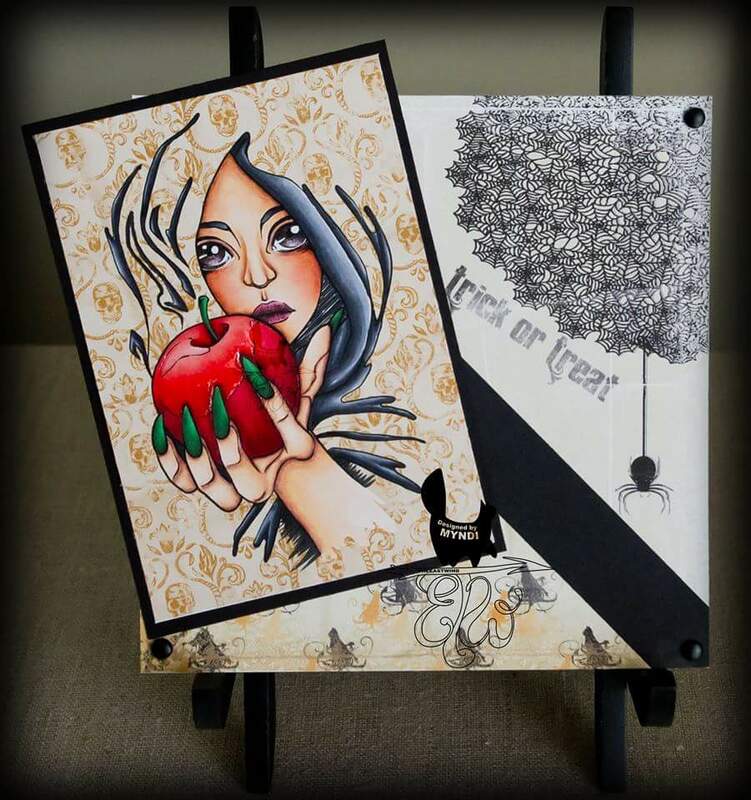 I coloured the image with Copics, and used Glossy Accents over part of the apple, but it's nearly impossible to see in the picture. I'm not really a Halloween person, so I am short on Halloween themed embellishments. Oh, well, a reason to go shopping, I guess. Make sure you pop over and submit a project for our "It's All About the Hair" challenge in our Facebook group. It closes on the 17th, so you have some time, but don't miss out on the chance to win some free digis!! There are also twice monthly challenges on the blog HERE.